The Glass Bowl is truly one of America's great college football stadiums. Originally built in 1937, the Glass Bowl was renovated in 1990. As a result of those changes, the new Glass Bowl has become a graceful synthesis of modern technology and old-time charm and craftsmanship. More recent improvements to the Glass Bowl include the addition of the installation of a new Field Turf playing surface in 2008 and a new videoboard in 2010. The Glass Bowl features a three-level press tower that houses 45 private suites, 300-seat Stadium Club and Gerber Media Center. CLICK HERE and fill out the form to receive more information on premium seating at the Glass Bowl. As a suite holder in one of the finest football facilities in the country, you will be able to entertain your clients and enjoy college football at its best. The Glass Bowl offers many opportunities for local companies to become suite holders. Whether you are looking for a full suite or a portion of a suite, we have the options to meet your needs. Pre-game buffet for UT games. Cable and closed circuit TV, sound system and all of the amenities. Convenient beverage/in-suite food service ordering process. 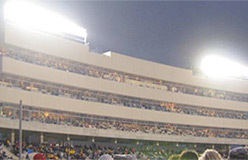 Often referred to as the “best seats in the house,” the stadium club is a 300-seat, theater-style area located on the first floor of the press tower, between the 25-yard lines. The Stadium Club is ideal for business owners who are interested in networking and/or entertaining clients and for anyone who would like to experience Rocket football VIP-style. You may also choose to package these seats with outside season tickets for football and/or season tickets for basketball. Premium parking and the use of the Joe Grogan Room in Savage Arena for Rocket basketball games will be provided if you choose to package with basketball. These packages provide entertainment options from September through March for the true Rocket fan. 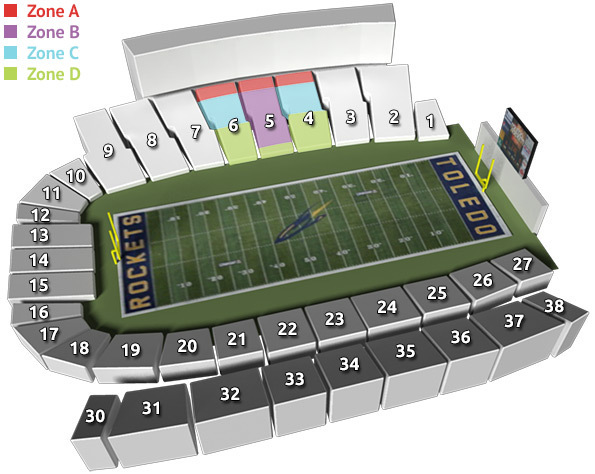 Our most popular season ticket program offers seating on the west side of the Glass Bowl in sections 4,5 or 6, directly behind the Rocket's bench between the 30 yard lines. These plans offer you the option to purchase up to four season tickets with the Zones B, C and D plans, and up to six seats with a gift in the Zone A plan. Additional seats may be purchased, with the premium seat payment adjusted accordingly. All donors will receive a season parking pass, with area assignment based on your total giving level to the Rocket Fund.